The USS Bismarck is a Century Class - Odyssey Subtype Command Battleship that was launched in 2423. It is the current flagship of the 16th Fleet. The year 2418 was marred by one of the most devastating events that the galaxy had ever faced: the brutal attack by the forces of the Supremacy upon the Federation, the Klingons, and the Romulans. While the enemy forces were able to be repelled by the combined efforts of these three empires the damage had been done and Starfleet the Klingon Defense Force, and the Romulan Imperial Navy had been decimated. Because of this all three Empires entered into a new pact known as the Federation Alliance with an increased desire for peace and prosperity among all three groups. Through sharing of resources efforts were resumed to construct new vessels to replace those lost to renew exploration of the galaxy. One of the first vessels built of this new mandate was the USS Bismarck. Constructed at the 40 Eridani A Starfleet Construction Yards near Vulcan, the Bismarck started life with the intention that it would be named the USS San Francisco in honor of the City of San Francisco, which was destroyed in the Vaadwaur attack. Nearly 60% of the vessel's hull was constructed of materials that were recycled from the destroyed city and vessels that were lost in combat against the Supremacy during the Battle of Earth. This led the vessel to become marred in controversy as many felt the vessel honoring the citizens of San Francisco should be constructed at the newly restored San Francisco Fleet Yard. Further controversy came when Starfleet Command, agreeing with protesters, ordered the vessel renamed Bismarck and reassigned the name San Francisco to an under development Defiant Class starship being prepared at San Francisco Yards. Further disruption came when separatists from the reborn Terra Prime movement launched a symbolic attack upon the Bismarck and nearly destroyed the under construction spaceframe in protest to the growing number of alien citizens of Earth. Despite the damage, the Bismarck was repaired and construction completed in 2423. She was launched to much fanfare under the command of Captain Sarah Reese, a Starfleet Officer who had lost her son during the Battle of Earth. Attached to the 1st Fleet, the Bismarck was assigned by Admiral William Teagarden to lead Task Group 4 as they patrolled the Vulcan Sector. When the Federation Alliance's relationship began to sour with elements of the Romulan Star Empire, the Bismarck attacked a relief convoy sent by the Romulans to aid Vulcan due to resource scarcity in the Federation. Shortly afterward the Bismarck would be reassigned from its duties in the 1st Fleet and was assigned to the 10th Fleet near the Cardassian Union to provide front line interdiction and force projection duties. During this assignment the Bismarck would find herself, primarily, on patrol of the newly restored Demilitarized Zone between the Federation and the Cardassian Union. As part of this assignment the Bismarck also found herself frequently assigned to defend relief convoys providing assistance to Cardassia's outlying communities. 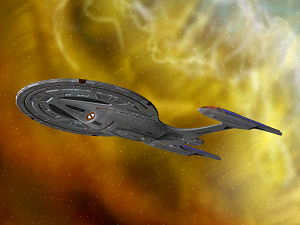 While under the command of Captain Cameron Reese, daughter of the vessel's original Captain Sarah Reese, in 2425 the Bismarck responded to a distress call being emanated from the Starships Enterprise and Vigilance. The vessels had launched an attack on the True Way and their outpost at Vlulyr Tuok in the Maelstrom Sector and had taken heavy damage from the station and its unlikely defender: the USS Ark Royal. The Bismarck was able to assist with evacuating survivors from the area; however, she came under fire herself from the Cardassian warship Hutet and was nearly destroyed with Captain Reese severely injured in the fight. Admiral Kor was able to assume command and was able to extricate Starfleet forces from the region. For his efforts, Admiral William Teagarden selected Captain Kor to replace him as the director of the 16th Fleet and promoted him to the rank of Admiral. In 2427 Admiral Kor was reassigned to Project Longshot and the Bismarck has returned to Spacedock for a minor refit.